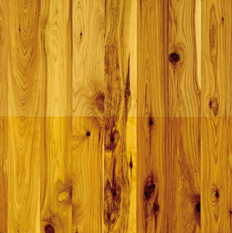 Color: Cream-colored sapwood; heartwood is honey-gold to brown with darker knots throughout. Variations Within Species And Grades: High degree of color variability. Hardness/Janka: 1375; 6% harder than Northern red oak. Dimensional Stability: Excellent (change coefficient .00162; 56% more stable than red oak). However, actual installations have demonstrated significant movement in use. Nailing: Can be brittle (like Brazilian cherry); splits easily.